Roger Barone Photo Via Photos from Philly. The US Army Rugby team enters the Battleship New Jersey. In an effort to draw publicity to the Penn Mutual Collegiate Rugby Championship which will be held at the Talen Energy Stadium, on June 4 and 5 of this year. 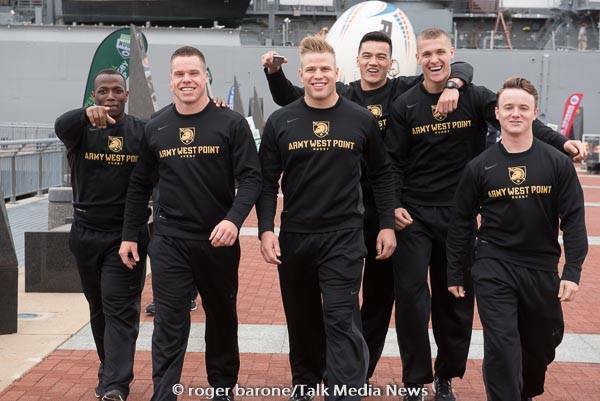 Two Military Academies brought their Rugby teams to greet people. The choice of venue was on the Battleship New Jersey, which is located in Camden , right across the river from Philadelphia. The Talen Energy Stadium is formerly PPL Park and is located off of Highland Avenue in Chester Pa, near the water.